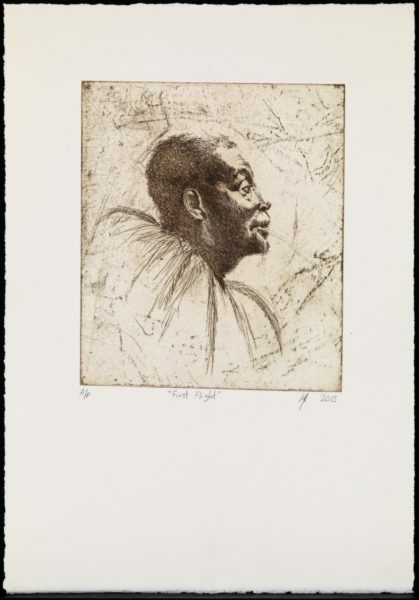 Lynette Yiadom-Boakye, First Flight, 2015, 10 hard-ground etchings on Somerset Soft White Velvet, 300gsm, 39 x 27cm, Edition 1/10. Courtesy Corvi-Mora, London, and Jack Shainman Gallery, New York. Lynette Yiadom-Boakye (b.1977) lives and works in London. 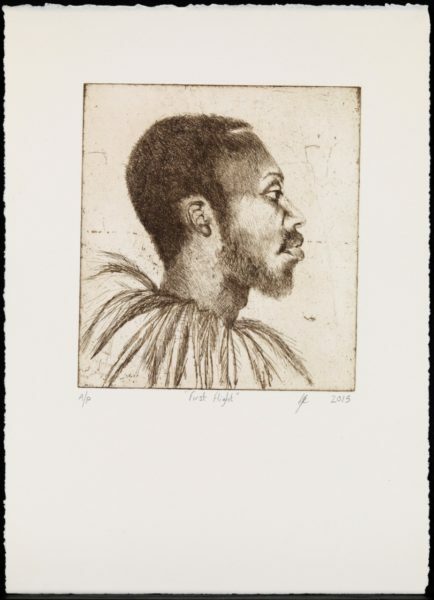 She recently held solo shows Lynette Yiadom-Boakye: Verses After Dusk, at the Serpentine Gallery in London (2015); and Capsule 03: Lynette Yiadom-Boakye at Haus der Kunst in Munich (2015–16). In 2012, she received the Pinchuk Foundation Future Generation Art Prize, and in 2013, she was shortlisted for the Turner Prize. 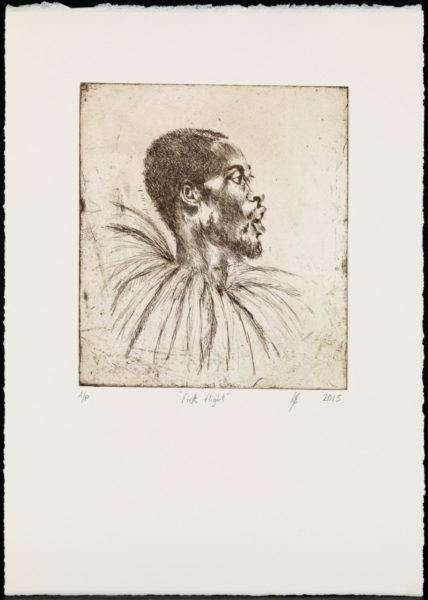 With an unflinching painterly approach and distinctive portrayal of light, movement and depth, Yiadom-Boakye’s process is spontaneous, fast and deliberate. Her creations are stunning contemporary portraits created from ambiguous recollections, imaginings and memories that exist outside of time and space. 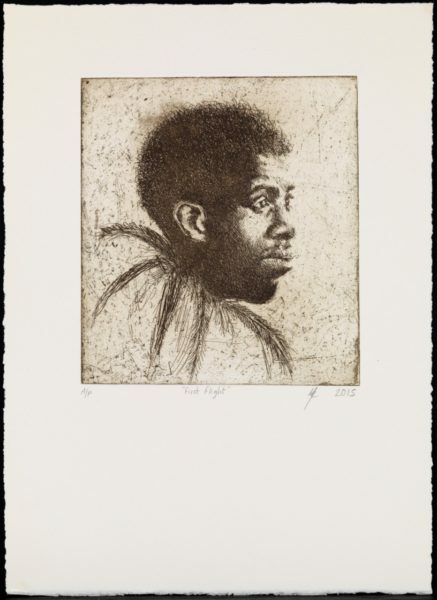 Yiadom-Boakye has been much praised for her critical engagement with the history of figurative art. 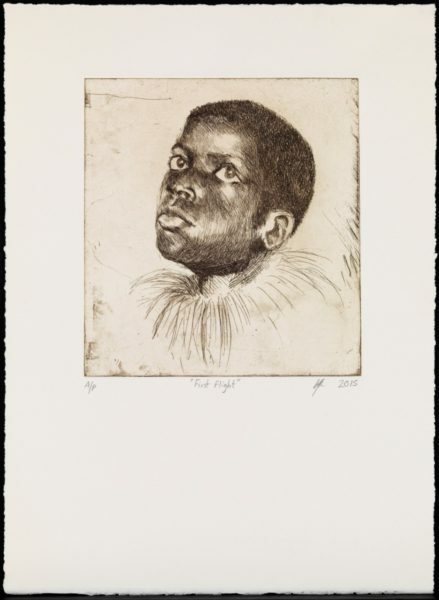 Despite the stark contrasts in her technique and content, she makes clear reference to traditions of European portraiture. 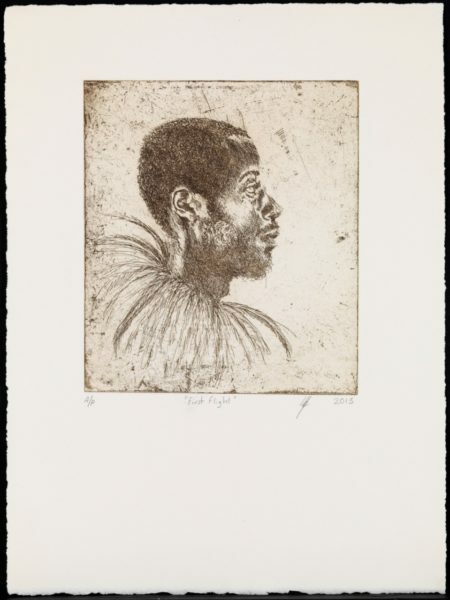 This approach, of looking to the past yet creating something new, is also seen in her application of undefined memory and imagination to create subjects and personas. The artist often works in series and gives her works cryptic titles that provoke the viewer to construct their own narratives and meanings for each piece. 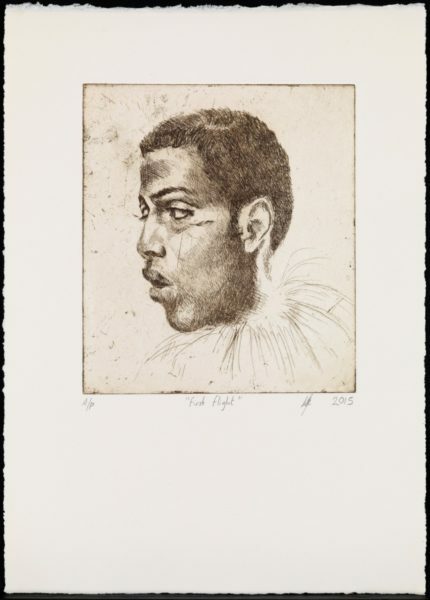 First Flight (2015) is an edition of ten hardground etchings made to accompany her acclaimed exhibition at the Serpentine Gallery in the summer of 2015. 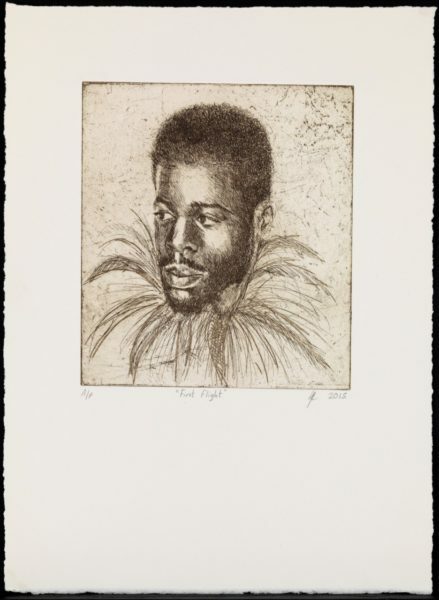 The ten portraits each depict single, black, male figures wearing the ruffs of feathers that have become a familiar motif in her work. Each man appears in profile or three-quarter view and is of a slightly different generation; fascination arises from the differences in demeanour and expression, with each variously contemplative and amused. 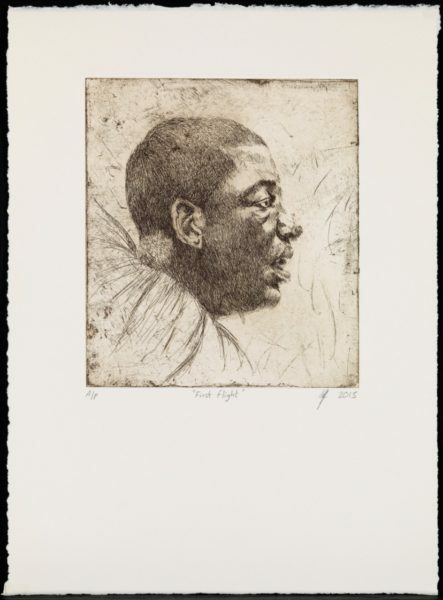 Etching has emerged as central to Yiadom-Boakye’s overall project, and First Flight is the most substantial edition she has made to date. 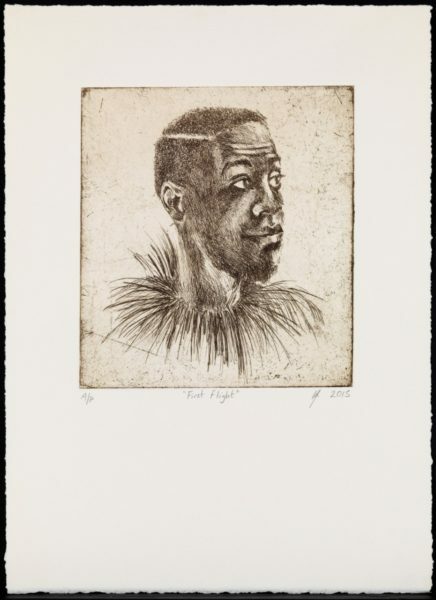 The acquisition of this important series for The Stanley & Audrey Burton Gallery, University of Leeds, makes fascinating links between the gallery’s contemporary practice and its traditional portraiture collections. Her interest in automatic painting and eliciting creative responses from her audience also links her work to British modernists, such as Alan Davie (former Gregory Fellow in Painting at the University of Leeds) or other contemporary painters represented in the gallery’s collection, including Christopher P. Wood.